http://www.swallowam.co.uk/ - Swallow Amusements - Supplier of arcade parts and games. http://www.arcadeworlduk.com/ - Arcade World UK - Supplier of SANWA arcade parts and other items. http://www.giz10p.co.uk/ - GIZ10p - Arcade parts, CRT Monitor and Sega specialist. http://www.andysarcade.net/ - Andys-Arcade - Arcade parts with lots of second hand stuff. http://www.starcab.net/ - Starcab - Large selection of brand new Arcade parts, looms, PSU etc... based in France but ships to the UK. https://www.akishop.jp/ - Akijabara Shop - Japan - Site for Buttons, Joysticks, Control Panels and much more, based in Japan but ships to the UK. http://www.ultimarc.com/ - Ultimarc - Lists lots of arcade information, interfaces and controls. http://www.jammaplus.co.uk/ - Jamma+ - great UK based forum with lots of discussions and information. http://www.arcadeotaku.com/ - Arcade Otaku - like Jamma+ but for mostly Candy machines. http://www.koenigs.dk/mame/eng/ - Project MAME - great professional looking MAME cabinets with plans to download. http://www.willcoxonline.com/mame/ - Interesting hand made MAME arcade machine. 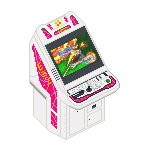 http://www.hard--candy.com/ - Nice information site on Japanese Candy Arcade Machines. http://www.johnsarcade.com/ - We are in the basement, need I say more.